Tryptophan (IUPAC-IUBMB abbreviation: Trp or W; IUPAC abbreviation: L-Trp or D-Trp; sold for medical use as Tryptan) is one of the 22 standard amino acids and an essential amino acid in the human diet, as demonstrated by its growth effects on rats. It is encoded in the standard genetic code as the codon UGG. Only the L-stereoisomer of tryptophan is used in structural or enzyme proteins, but the R-stereoisomer is occasionally found in naturally produced peptides (for example, the marine venom peptide contryphan). The distinguishing structural characteristic of tryptophan is that it contains an indole functional group. The isolation of tryptophan was first reported by Frederick Hopkins in 1901 through hydrolysis of casein. From 600 grams of crude casein one obtains 4-8 grams of tryptophan. Plants and shikimic acid or anthranilate. The latter condenses with phosphoribosylpyrophosphate (PRPP), generating pyrophosphate as a by-product. After ring opening of the ribose moiety and following reductive decarboxylation, indole-3-glycerinephosphate is produced, which in turn is transformed into indole. In the last step, tryptophan synthase catalyzes the formation of tryptophan from indole and the amino acid serine. The industrial production of tryptophan is also biosynthetic and is based on the fermentation of serine and indole using either wild-type or genetically modified bacteria such as B. amyloliquefaciens, B. subtilis, C. glutamicum or E. coli. These strains carry either mutations that prevent the reuptake of aromatic amino acids or multiple/overexpressed trp operons. The conversion is catalyzed by the enzyme tryptophan synthase. Auxin (a phytohormone) when sieve tube elements undergo apoptosis. The disorder fructose malabsorption causes improper absorption of tryptophan in the intestine, reduced levels of tryptophan in the blood, and depression. The authors did not find reduced tryptophan in cases of lactose maldigestion. In bacteria that synthesize tryptophan, high cellular levels of this amino acid activate a chocolate, oats, dried dates, milk, yogurt, cottage cheese, red meat, eggs, fish, poultry, sesame, chickpeas, sunflower seeds, pumpkin seeds, spirulina, bananas, and peanuts. Contrary to the popular belief  that turkey has a particularly high amount of tryptophan, the amount of tryptophan in turkey is typical of most poultry. There is also a myth that plant protein lacks tryptophan; in fact, tryptophan is present in significant amounts in almost all forms of plant protein, and abundant in some. Since tryptophan is converted into 5-hydroxytryptophan (5-HTP) which is subsequently converted into the neurotransmitter serotonin, it has been proposed that consumption of tryptophan or 5-HTP may therefore improve depression symptoms by increasing the level of serotonin in the brain. Small studies have been performed using 5-HTP and tryptophan as adjunctive therapy in addition to standard treatment for depression. While some studies had positive results, they were criticized for having methodological flaws, and a more recent study did not find sustained benefit from their use. The safety of these medications has not been well studied. Due to the lack of high quality studies and preliminary nature of studies showing effectiveness and the lack of adequate study on their safety, the use of tryptophan and 5-HTP is not highly recommended or thought to be clinically useful. There is evidence that blood tryptophan levels are unlikely to be altered by changing the diet, but tryptophan is available in health food stores as a dietary supplement. Consuming purified tryptophan increases brain serotonin whereas eating foods containing tryptophan does not. This is because the transport system which brings tryptophan across the blood-brain barrier is also selective for the other amino acids which are contained in protein food sources. High plasma levels of other large neutral amino acids prevent the plasma concentration of tryptophan from increasing brain concentration levels. 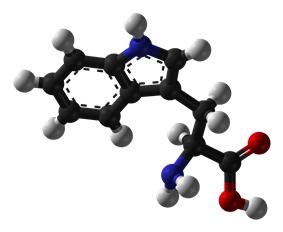 A metabolite of tryptophan, 5-hydroxytryptophan (5-HTP), has been suggested as a treatment for epilepsy and depression, since 5-HTP readily crosses the blood–brain barrier and in addition is rapidly decarboxylated to serotonin (5-hydroxytryptamine or 5-HT). Clinical trials, however, are regarded as inconclusive and lacking. Serotonin has a relatively short half-life since it is rapidly metabolized by monoamine oxidase. Due to the conversion of 5-HTP into serotonin by the liver, there may be a significant risk of heart valve disease from serotonin's effect on the heart. Tryptophan is marketed in Europe for depression and other indications under the brand names Cincofarm and Tript-OH. In the United States, 5-HTP does not require a prescription, as it is covered under the Dietary Supplement Act. Since the quality of dietary supplements is now regulated by the U.S. Food and Drug Administration, manufacturers are required to market products whose ingredients match the labeling, but are not required to establish efficacy of the product. The primary product of the liver enzyme tryptophan dioxygenase is kynurenine. There was a large outbreak of eosinophilia-myalgia syndrome (EMS) in the U.S. in 1989, which caused 1,500 cases of permanent disability and at least thirty-seven deaths. After preliminary investigation revealed that the outbreak was linked to intake of tryptophan, the U.S. Food and Drug Administration (FDA) banned most tryptophan from sale in the US in 1991, and other countries followed suit. Subsequent epidemiological studies however, were able to pinpoint the syndrome to those exposed to specific batches of L-tryptophan supplied by a single large Japanese manufacturer, Showa Denko KK. It eventually became clear that the cause had not been the tryptophan itself, but rather that flaws in Showa Denko's 1980s manufacturing process (long since corrected) had allowed trace impurities to contaminate these batches, and those impurities were in turn responsible for the 1989 EMS outbreak. Against this backdrop, the FDA rescinded its restriction on sales and marketing of tryptophan in February 2001, but continued to ban importation. The fact that the Showa Denko facility used genetically engineered bacteria to produce the contaminated batches of L-tryptophan later found to have caused the outbreak of eosinophilia-myalgia syndrome has been cited as evidence of a need for "close monitoring of the chemical purity of biotechnology-derived products." Those calling for purity monitoring have, in turn, been criticized as anti-GMO activists who overlook possible non-GMO causes of contamination and threaten the development of biotech. A common assertion is that heavy consumption of turkey meat results in drowsiness, due to high levels of tryptophan contained in turkey. However, the amount of tryptophan in turkey is comparable to that contained in most other meats. Furthermore, post-meal drowsiness may have more to do with what else is consumed along with the turkey and, in particular, carbohydrates. It has been demonstrated in both animal models and humans that ingestion of a meal rich in carbohydrates triggers release of insulin. Insulin in turn stimulates the uptake of large neutral branched-chain amino acids (BCAA), but not tryptophan (an aromatic amino acid) into muscle, increasing the ratio of tryptophan to BCAA in the blood stream. The resulting increased ratio of tryptophan to BCAA in the blood reduces competition at the large neutral amino acid transporter (which transports both BCAA and aromatic amino acids), resulting in the uptake of tryptophan across the blood–brain barrier into the cerebrospinal fluid (CSF). Once in the CSF, tryptophan is converted into serotonin in the raphe nuclei by the normal enzymatic pathway. The resultant serotonin is further metabolised into melatonin by the pineal gland. Hence, this data suggests that "feast-induced drowsiness"— or postprandial somnolence — may be the result of a heavy meal rich in carbohydrates, which, via an indirect mechanism, increases the production of sleep-promoting melatonin in the brain. ^ Dawson RMC, et al. (1969). Data for Biochemical Research. Oxford: Clarendon Press. ^ Pallaghy PK, Melnikova AP, Jimenez EC, Olivera BM, Norton RS (1999). "Solution structure of contryphan-R, a naturally-occurring disulfide-bridged octapeptide containing D-tryptophan: comparison with protein loops". Biochemistry 38 (35): 11553–9. ^ Hopkins FG, Cole SW (1901). "A contribution to the chemistry of proteids: Part I. A preliminary study of a hitherto undescribed product of tryptic digestion". J. Physiol. (Lond.) 27 (4–5): 418–28. ^ Radwanski ER, Last RL (1995). 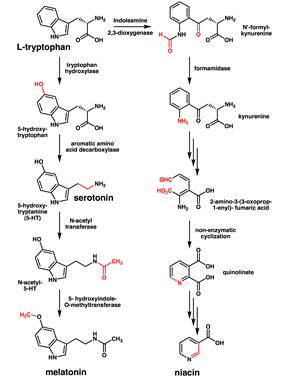 "Tryptophan biosynthesis and metabolism: biochemical and molecular genetics". Plant Cell 7 (7): 921–34. ^ Ikeda M (2002). "Amino acid production processes". Adv. Biochem. Eng. Biotechnol. Advances in Biochemical Engineering/Biotechnology 79: 1–35. ^ Becker J, Wittmann C (2012). "Bio-based production of chemicals, materials and fuels -Corynebacterium glutamicum as versatile cell factory". Curr. Opin. Biotechnol. 23 (4): 631–40. ^ Conrado RJ, Varner JD, DeLisa MP (2008). "Engineering the spatial organization of metabolic enzymes: mimicking nature's synergy". Curr. Opin. Biotechnol. 19 (5): 492–9. ^ Fernstrom JD (1983). "Role of precursor availability in control of monoamine biosynthesis in brain". Physiol. Rev. 63 (2): 484–546. ^ Schaechter JD, Wurtman RJ (1990). "Serotonin release varies with brain tryptophan levels". Brain Res. 532 (1–2): 203–10. ^ a b Wurtman RJ, Anton-Tay F (1969). "The mammalian pineal as a neuroendocrine transducer". Recent Prog. Horm. Res. 25: 493–522. ^ a b Ikeda M, Tsuji H, Nakamura S, Ichiyama A, Nishizuka Y, Hayaishi O (1965). 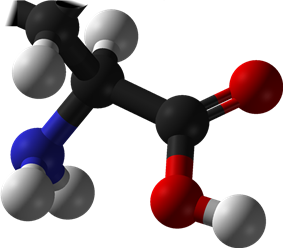 "Studies on the biosynthesis of nicotinamide adenine dinucleotide. II. A role of picolinic carboxylase in the biosynthesis of nicotinamide adenine dinucleotide from tryptophan in mammals". J. Biol. Chem. 240 (3): 1395–401. ^ Palme K, Nagy F (April 2008). "A new gene for auxin synthesis". Cell 133 (1): 31–2. ^ a b Ledochowski M, Widner B, Murr C, Sperner-Unterweger B, Fuchs D (2001). "Fructose malabsorption is associated with decreased plasma tryptophan". Scand. J. Gastroenterol. 36 (4): 367–71. ^ Ledochowski M, Sperner-Unterweger B, Widner B, Fuchs D (1998). "Fructose malabsorption is associated with early signs of mental depression". Eur. J. Med. Res. 3 (6): 295–8. ^ Gollnick P, Babitzke P, Antson A, Yanofsky C (2005). "Complexity in regulation of tryptophan biosynthesis in Bacillus subtilis". Annu. Rev. Genet. 39: 47–68. ^ a b Helmenstine AM. "Does Eating Turkey Make You Sleepy?". About.com. Retrieved 2013-11-13. ^ a b c Ballantyne C (2007-11-21). "Does Turkey Make You Sleepy?". Scientific American. Retrieved 2013-06-06. ^ a b McCue K. "Chemistry.org: Thanksgiving, Turkey, and Tryptophan". Archived from the original on 2007-04-04. Retrieved 2007-08-17. ^ a b c Joanne Holden, Nutrient Data Laboratory, Agricultural Research Service. "USDA National Nutrient Database for Standard Reference, Release 22". United States Department of Agriculture. Retrieved 2009-11-29. ^ a b c Shaw K, Turner J, Del Mar C (2002). "Tryptophan and 5-hydroxytryptophan for depression.". The Cochrane database of systematic reviews (1): CD003198. ^ a b Ravindran AV, da Silva TL (Sep 25, 2013). "Complementary and alternative therapies as add-on to pharmacotherapy for mood and anxiety disorders: a systematic review.". Journal of Affective Disorders 150 (3): 707–19. ^ Soh, Nerissa L. AU - Walter, Garry TI (2011). "Tryptophan and depression: can diet alone be the answer?". Acta Neuropsychiatrica VL 23 (1): 1601–5215;. ^ Fernstrom JD (2012). "Effects and side effects associated with the non-nutritional use of tryptophan by humans". J. Nutr. 142 (12): 2236S–2244S. ^ Wurtman RJ, Hefti F, Melamed E. Precursor control of neurotransmitter synthesis. Pharmacol Rev 1980;32:315-35. ^ Kostowski W, Bidzinski A, Hauptmann M, Malinowski JE, Jerlicz M, Dymecki J (1978). "Brain serotonin and epileptic seizures in mice: a pharmacological and biochemical study". Pol J Pharmacol Pharm 30 (1): 41–7. ^ Hardebo JE, Owman C (1980). "Barrier mechanisms for neurotransmitter monoamines and their precursors at the blood-brain interface". Annals of Neurology 8 (1): 1–31. ^ Turner EH, Loftis JM, Blackwell AD (2006). "Serotonin a la carte: supplementation with the serotonin precursor 5-hydroxytryptophan". Pharmacol Ther 109 (3): 325–38. ^ Gustafsson BI, Tømmerås K, Nordrum I, Loennechen JP, Brunsvik A, Solligård E, Fossmark R, Bakke I, Syversen U, Waldum H (March 2005). "Long-term serotonin administration induces heart valve disease in rats". Circulation 111 (12): 1517–22. ^ Xu J, Jian B, Chu R, Lu Z, Li Q, Dunlop J, Rosenzweig-Lipson S, McGonigle P, Levy RJ, Liang B (December 2002). "Serotonin mechanisms in heart valve disease II: the 5-HT2 receptor and its signaling pathway in aortic valve interstitial cells". Am. J. Pathol. 161 (6): 2209–18. ^ "Dietary Supplements: Background Information". Retrieved 2011-05-10. ^ Opitz CA, Litzenburger UM, Sahm F, Ott M, Tritschler I, Trump S, Schumacher T, Jestaedt L, Schrenk D, Weller M, Jugold M, Guillemin GJ, Miller CL, Lutz C, Radlwimmer B, Lehmann I, von Deimling A, Wick W, Platten M (October 2011). "An endogenous tumour-promoting ligand of the human aryl hydrocarbon receptor". ^ Jackson RW (1930). "A synthesis of tryptophol". Journal of Biological Chemistry 88 (3): 659–662. ^ a b "COT statement on tryptophan and the eosinophilia-myalgia syndrome". UK Committee on Toxicity of Chemicals in Food, Consumer Products and the Environment. June 2004, updated December 2005. ^ Slutsker L, Hoesly FC, Miller L, Williams LP, Watson JC, Fleming DW (1990). "Eosinophilia-myalgia syndrome associated with exposure to certain specific batches of tryptophan from a single manufacturer". JAMA 264 (2): 213–7. ^ Back EE, Henning KJ, Kallenbach LR, Brix KA, Gunn RA, Melius JM (1993). "Risk factors for developing eosinophilia myalgia syndrome among L-tryptophan users in New York". J. Rheumatol. 20 (4): 666–72. ^ Kilbourne EM, Philen RM, Kamb ML, Falk H (1996). "Tryptophan produced by Showa Denko and epidemic eosinophilia-myalgia syndrome". The Journal of rheumatology. Supplement 46: 81–8; discussion 89–91. ^ a b c "Information Paper on L-tryptophan and 5-hydroxy-L-tryptophan". FU. S. Food and Drug Administration, Center for Food Safety and Applied Nutrition, Office of Nutritional Products, Labeling, and Dietary Supplements. 2001-02-01. Archived from the original on 2005-02-25. Retrieved 2012-02-08. ^ Mayeno AN, Lin F, Foote CS, Loegering DA, Ames MM, Hedberg CW, Gleich GJ (1990). "Characterization of "peak E," a novel amino acid associated with eosinophilia-myalgia syndrome". Science 250 (4988): 1707–8. ^ Ito J, Hosaki Y, Torigoe Y, Sakimoto K (1992). "Identification of substances formed by decomposition of peak E substance in tryptophan". Food Chem. Toxicol. 30 (1): 71–81. ^ Mayeno AN, Gleich GJ (September 1994). "Eosinophilia-myalgia syndrome and tryptophan production: a cautionary tale". Trends Biotechnol. 12 (9): 346–52. ^ Raphals P (2000). "Does medical mystery threaten biotech?". Science 250 (4981): 4981. ^ "Food & mood. (neuroscience professor Richard Wurtman) (Interview)". Nutrition Action Healthletter (HighBeam Research). September 1992. ^ a b c Fernstrom JD, Wurtman RJ (1971). "Brain serotonin content: increase following ingestion of carbohydrate diet". Science 174 (4013): 1023–5. ^ a b Lyons PM, Truswell AS (1988). "Serotonin precursor influenced by type of carbohydrate meal in healthy adults". Am. J. Clin. Nutr. 47 (3): 433–9. ^ a b c Wurtman RJ, Wurtman JJ, Regan MM, McDermott JM, Tsay RH, Breu JJ (2003). "Effects of normal meals rich in carbohydrates or proteins on plasma tryptophan and tyrosine ratios". Am. J. Clin. Nutr. 77 (1): 128–32. ^ a b Afaghi A, O'Connor H, Chow CM (2007). "High-glycemic-index carbohydrate meals shorten sleep onset". Am. J. Clin. Nutr. 85 (2): 426–30. ^ Pardridge WM, Oldendorf WH (1975). "Kinetic analysis of blood–brain barrier transport of amino acids". Biochim. Biophys. Acta 401 (1): 128–36. ^ Maher TJ, Glaeser BS, Wurtman RJ (1984). "Diurnal variations in plasma concentrations of basic and neutral amino acids and in red cell concentrations of aspartate and glutamate: effects of dietary protein intake". Am. J. Clin. Nutr. 39 (5): 722–9. "KEGG PATHWAY: Tryptophan metabolism - Homo sapiens". KEGG: Kyoto Encyclopedia of Genes and Genomes. 2006-08-23. Retrieved 2008-04-20. G.P. Moss. "Tryptophan Catabolism (early stages)". Nomenclature Committee of the International Union of Biochemistry and Molecular Biology (NC-IUBMB). Retrieved 2008-04-20. G.P. Moss. "Tryptophan Catabolism (later stages)". Nomenclature Committee of the International Union of Biochemistry and Molecular Biology (NC-IUBMB). Retrieved 2008-04-20. B Mikkelson, DP Mikkelson (2007-11-22). "Turkey Causes Sleepiness". Urban Legends Reference Pages. Snopes.com. Retrieved 2008-04-20. Wood RM, Rilling JK, Sanfey AG, Bhagwagar Z, Rogers RD (2006). "Effects of tryptophan depletion on the performance of an iterated Prisoner's Dilemma game in healthy adults". Neuropsychopharmacology 31 (5): 1075–84.